Beginning last year with Murmur, the R.E.M. catalog is once again getting the redux treatment — up next, Reckoning (more on that next week). Listening the reissue I’ve been digging out my IRS-era vinyl including Lifes Rich Pageant. On it, with Mike Mills on lead vocals, the band covers “Superman” by The Clique, a Texas based sixties pop band. Check it. 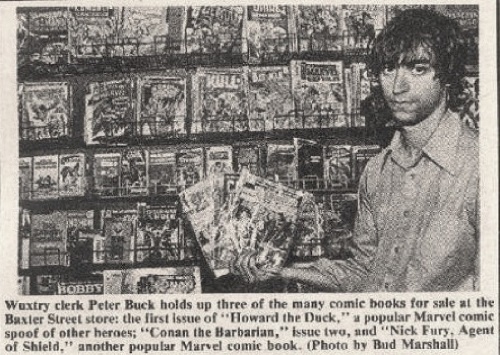 This is also an excuse to run the above newspaper clipping of Buck during his days as a record store clerk, in Athens, at Wuxtry. He should be proud. He looks like the quintessential comic book salesman. This post has sent me off on a Gary Zekley tangent, which is a good way to occupy yourself on a June day. Here’s a YouTube video of him singing “Superman” with REM. I’ve been engaged in taxes for longer then I care to admit, both on the private side (all my employed life story!!) and from a legal point of view since satisfying the bar and following up on tax law. I’ve provided a lot of advice and righted a lot of wrongs, and I must say that what you’ve put up makes complete sense. Please continue the good work – the more people know the better they’ll be equipped to handle with the tax man, and that’s what it’s all about.